Syria's rebels announced the launch of a "Damascus volcano" offensive against regime forces, which according to activists deployed helicopters today in a Damascus neighbourhood rocked by intense fighting. 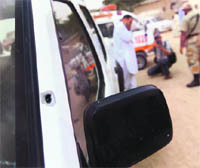 Unidentified gunmen today opened fire on a UN vehicle in the southern Pakistani port city of Karachi injuring a foreign doctor working on a polio immunisation campaign and a local driver. Asma to be new Pak PM ? A cheerful Sunita Williams and two of her colleagues today successfully docked their Soyuz capsule with the International Space Station for a four-month scientific mission, two days after the record-setting Indian- American astronaut blasted off for her second space odyssey. An awkward disconnect between civil and military authorities came to light on Monday, in relation to Pakistan’s planned meetings in the US, with whom relations are beginning to thaw. For the first time, a once-a-day pill which reduces the chance of contracting HIV among high-risk groups "significantly" has got a green signal in the US, where 1.2 million people are infected by the deadly disease. Chief Justice Iftikhar Muhammad Chaudhry on Monday said a Bangladesh-type set-up was not possible in Pakistan, adding that no one had the right to topple the government. If diplomatic achievements were measured by the number of countries visited, Hillary Rodham Clinton would be the most accomplished secretary of state in history. While historians will debate and eventually rate her tenure as America's top diplomat, Clinton is already assured of a place in the State Department record book. The Election Commission of Pakistan (ECP) asked members of Parliament and provincial assemblies on Monday to submit the annual statements of their assets and liabilities by September 30. How a person walks can be a clue to whether he has Alzheimer's, after researchers found a link between the disease and a person's gait. Russia, meanwhile, slammed as "blackmail" Western pressure to push for a UN Security Council resolution against Syria's regime, as a top defector warned that Assad would not hesitate to use chemical weapons against his own people. The Free Syrian Army's central-Homs Joint Command said its operation, dubbed "the Damascus volcano and earthquakes of Syria," was launched "in response to massacres and barbaric crimes" committed by the Assad regime. 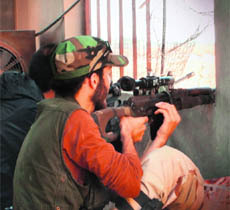 The FSA, the statement said, started to conduct "attacks on all security stations and branches in the cities and the countryside, to enter into fierce clashes (with their forces) and to call on them to surrender." The FSA called for all international roads to be cut off, "from (northern) Aleppo to (southern) Daraa and from (eastern) Deir Ezzor to (coastal) Latakia, to cut off and seize the supply lines." Hours after the FSA announcement, monitors and activists reported that the regime had early today deployed helicopters to fire into Qaboon district of Damascus and that rebels and troops had clashed violently in Al-Midan and Al-Hajar al-Aswad neighbourhoods. "Regime forces used helicopters equipped with heavy machineguns to strike the district of Qaboon," said the Britain-based Syrian Observatory for Human Rights. A Damascus-based activist told AFP that the helicopter assault came after the FSA in Qaboon had repulsed an attempt by regular troops to reclaim the neighbourhood. Baghdad: Iraqi authorities received on Tuesday bodies of 21 Iraqis killed during Syria's unrest at a border area in the country's western province of Anbar, a provincial security source said. "Syrian security authorities handed over the Iraqi side bodies of 21 Iraqis at al-Waleed border point near the city of al-Qaim, 330 km west of Baghdad" the source said on condition of anonymity. The UN Land Cruiser vehicle was passing through Koochi Camp near Sohrab Goth when the motorcycle-borne gunmen fired. Police said the Ghanaian doctor, identified only as Dr Fostan, was going to a polio immunisation clinic in Koochi Camp, one of the Afghan refugee settlements here, when gunmen opened fire on his vehicle. Police sources said the doctor and his driver had received injuries and were taken to hospital. Police sources said initial investigations showed that two young Afghan men had opened fire on the vehicle. Taliban commanders have banned the polio immunisation drive in the North and South Waziristan claiming they would not allow it until the US stops its drone attacks on innocent people. "One of our drivers and a health staff member were injured but they are presently both stable", the spokesman from the UN's World Health Organisation (WHO) said. 46-year-old NASA astronaut Williams, Russian Soyuz Commander Yuri Malenchenko and Japan aerospace agency flight engineer Akihiko Hoshide reached the ISS after two days in orbit aboard Russian-made Soyuz TMA-05M spacecraft. Moments after Defence Secretary Nargis Sethi announced the Army chief General Ashfaq Pervaiz Kayani would visit the US as part of the strategic dialogue, military sources rubbished Defence Secretary’s claim. If the visit materialises, it would be the first by Kayani since disruption of Pak-US ties in the aftermath of a NATO attack on Pakistani border post Salala in November last year that killed 24 troops. Bilateral civil and military relations nosedived to an all-time low amid reprisal actions by Pakistan to disrupt supplies to NATO forces in Afghanistan through Pakistan which were reopened this month following months of painstaking negotiations. Kayani is believed to have played a key role in supplies’ resumption. Talking to the media after attending a meeting of the Senate’s Standing Committee on Defence, Sethi revealed even though the exact details of the Army chief’s visit were yet to be finalised, a tentative agenda was being prepared in consultation with all the ministries concerned. However, military sources, requesting anonymity, denied the report. The drug,'Truvada' can now be used by those at high risk of the infection and anyone who may engage in sexual activity with HIV-infected partners, the Food and Drug Administration (FDA) announced. “In two large clinical trials, daily use of the drug was shown to significantly reduce the risk of HIV infection," it said yesterday. However, some health workers and groups active in the HIV community opposed the approval for the once-a-day pill. There are concerns that circulation of such a drug could engender a false sense of security and mean people will take more risks. There have also been fears that a drug-resistant strain of HIV could develop. People diagnosed with HIV that without treatment develops into AIDS take antiviral medications to control the infection that attacks their immune system. In a statement, the FDA stressed that the drug should be used as part of a "comprehensive HIV prevention plan", including condom use and regular HIV testing. Justice Chaudhry observed that the judiciary, civil society and the country’s vibrant media provided guarantee to the democratic order and would not support any unconstitutional act. He made these observations during hearing of Asghar Khan’s petition on distribution of money by the Inter Services Intelligence (ISI) agency in 1990 to manipulate polls against Benazir Bhutto. A three-member bench headed by the Chief Justice is hearing the petition. The Supreme Court ruled that the Inter-Services Intelligence (ISI) could not have a functioning political cell in view of its judgment of July 31, 2009. It observed that that one point had been settled and it was that money was indeed distributed to manipulate the 1990 elections. If diplomatic achievements were measured by the number of countries visited, Hillary Rodham Clinton would be the most accomplished secretary of state in history. The commission said in accordance with the law, the sitting members of the National Assembly, Senate and provincial assemblies have to submit statements of assets of not only themselves, but also those of their spouses and dependents. Since there is no mechanism available to verify these statements, the practice has so far remained a cosmetic exercise in accountability. However, if implemented properly, the procedure can deter widespread corruption. If followed in its true spirit, any member found guilty of corruption may be disqualified from his office. The statements of assets and liabilities have to be published and any citizen can obtain a copy after paying a prescribed fee. Subtle changes in the way a person walks can be an early warning sign of cognitive decline and a signal for advanced testing, according to research released at Alzheimer's Association International Conference in Vancouver, Canada.